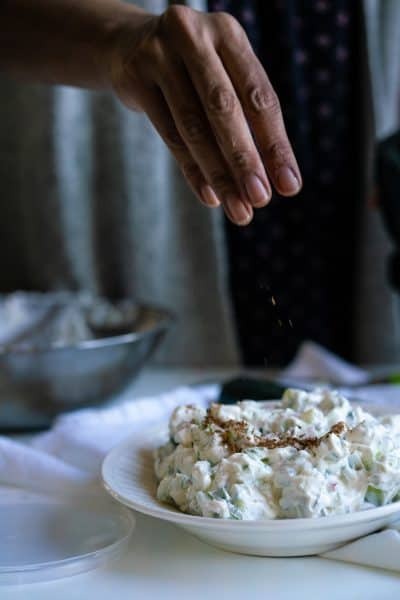 Cucumber Raita - a super easy and quick Indian side dish with a punch of flavor from freshly toasted cumin seeds, mint leaves, cilantro and fresh chili. 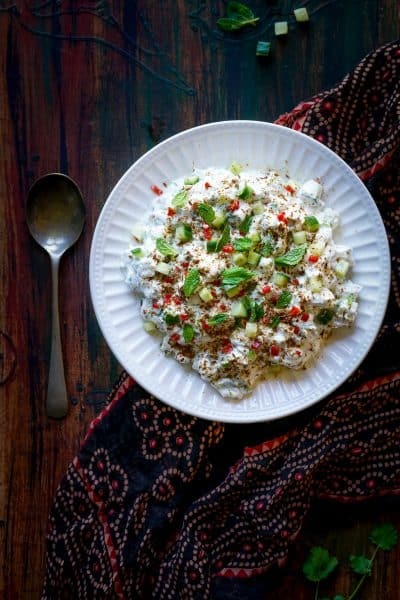 Cucumber Raita is one of the quintessential side dishes in Indian cooking. It is ever present on restaurant menus and equally so in homes across India. There are many variations of raita in Indian cuisine. In general, raita is made up of a combination of yogurt and cucumbers, beets, onion, pineapple or boondi. 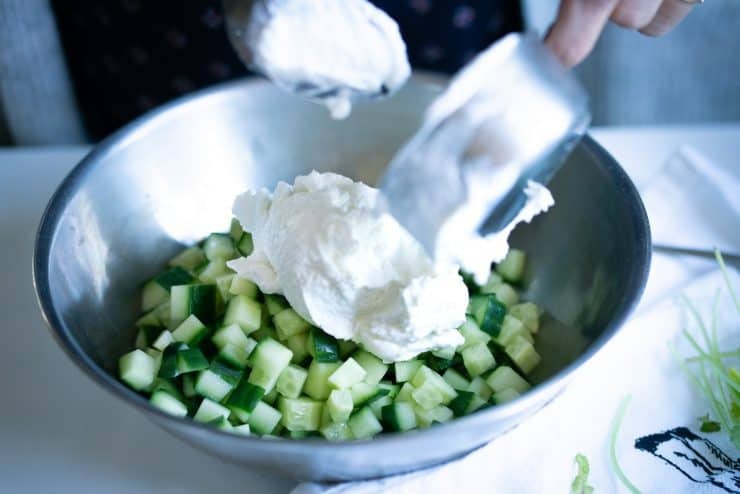 But even a cucumber raita will vary by region and then even by the cook making the dish. Cucumber raita is the best cooling accompaniment to any meal. It’s so quick and easy to make and compliments almost any Indian dish because of its cooling effect which balances out the spice. 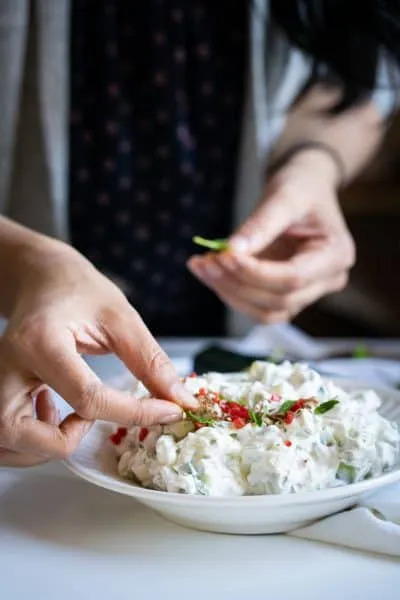 Cucumber raita is a lot like Greek tzatziki, but unlike tzatziki, raita is usually made with chilies. But even with chilies added, raita cools the palette. Like milk, the yogurt helps to neutralize the spiciness and it’s even served cold, which helps the cooling effect further. Raita is a very flexible dish with many variations. I’ve shared a modification of the one I grew up with but feel free to make it your own. If you want to leave out the cumin or the cilantro, go ahead. You can choose to grate your cucumber using a box grater instead of finely chopping it if you prefer that texture better. 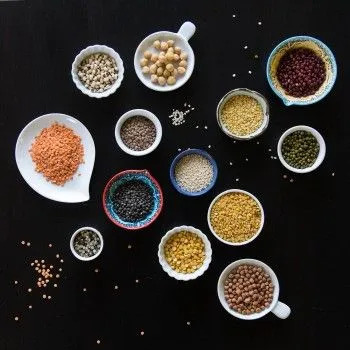 You can also add a vaghar (tadka; tempering spices) of mustard seeds and curry leaves if you like. In my home, cucumber raita always included mint but that can be optional too if you’re not a fan. 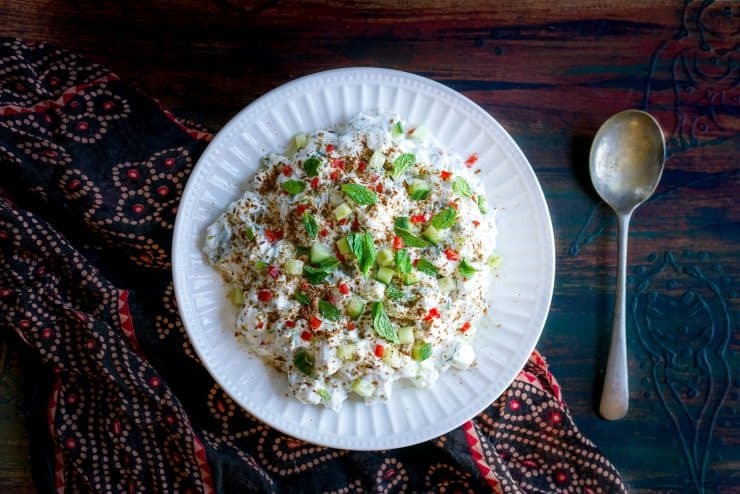 However you decide to make it, cucumber raita is a wonderful pairing with biryani, vegetable curries or really just about anything. Some restaurants will add a little sugar to their raita to sweeten it up. But I come from a Gujarati household, Gujju’s add sugar to everything but we didn’t add it to Raita. I’ve never liked it that way. In my family we didn’t eat cucumber raita a whole lot. 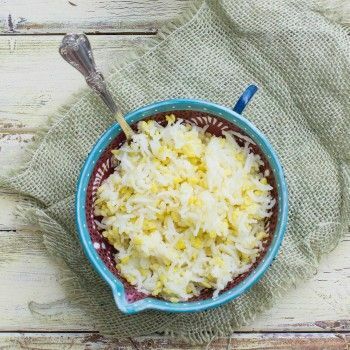 Often we simply ate yogurt with some salt and cumin with our meal. Growing up, my brother and I each had our favorite raita as well and it wasn’t cucumber raita. Boondi (little fried chickpea balls) raita was my favorite and pineapple raita was my brother’s. So the poor cucumber raita only came out when we had guests. As an adult I really appreciate the cucumber raita a lot more as it is so much healthier than the boondi raita that I love. Add the cumin seeds to a cast iron or steel skillet and heat, stirring often, until fragrant. Keep a close eye on them so they don’t burn. Do not use a non-stick skillet as those are not meant to be dry heated. Remove from heat and roughly crush the cumin seeds in a mortar and pestle. In a large bowl, combine all the ingredients and stir. Serve immediately. If not serving the raita immediately, mix all the ingredients except the cucumber and refrigerate the yogurt until ready to serve. Add in the cucumber just before serving.Letting the raita sit for a long time after adding in the cucumber will cause the cucumber juice to separate and pool liquid into the raita. This is totally fine. Just stir it back into the raita. Over time, it will cause the raita to get too watery. 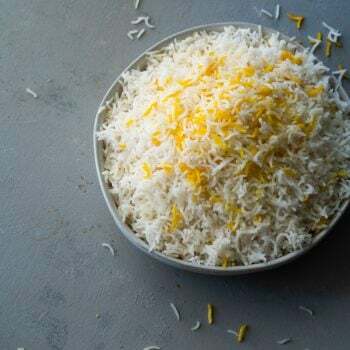 If I am prepping in advance, I will mix all the ingredients together ahead of time and add in the cucumber at the last minute to avoid a watery raita. But I will happily eat raita the next day. The texture is just a bit thinner. 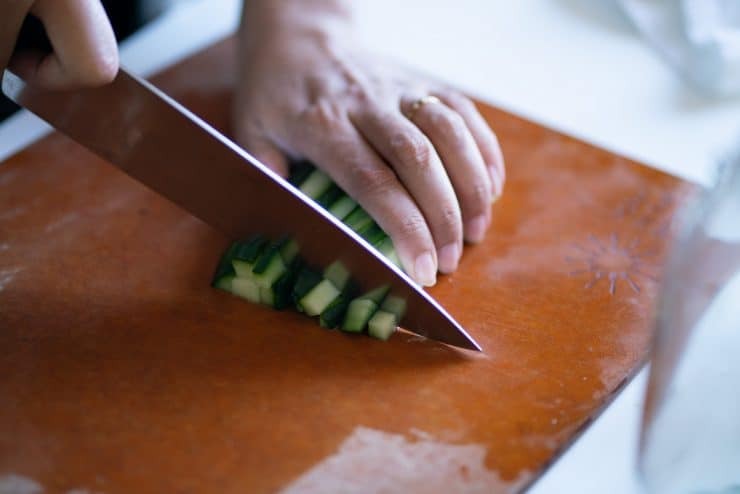 You could also choose to add a bit of salt to the chopped cucumber, let it sit for about 30 minutes and then squeeze out as much liquid as possible. Then add this cucumber to the yogurt. You could also choose to add a bit of salt to the chopped cucumber, let it sit for about 30 minutes and then squeeze out as much liquid as possible. Then add this cucumber to the yogurt. 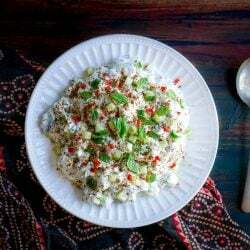 Comments on "Cucumber Raita, An Easy Indian Side Dish"
Love your recipes and getting adept at making your dal variations. Re the Raita: I use English cukes and remove the seeds (which we eat separately); that goes a long way to eliminating the 'watery' issue. Beautiful pics! I've also been experimenting with my raita recipes recently. This is a slight variation on the one I use as my base. I have to see how the mint changes the flavor, I think it will be a great addition! Traditionally, there is a pinch of black salt. Which, I know, is nearly impossible to find in the USA or elsewhere, but if you can find it, it will take you to knew levels of awesomeness.